After a thrilling round of Super Regionals that saw the most winner-take-all Game 3s since the round debuted in 1999, the eight team field in Omaha is set for the 2018 College World Series. The SEC will be the most represented conference in Omaha, sending three teams to TD Ameritrade Park. This comes just a year after the all-SEC final in which Florida knocked off LSU to capture its first title. 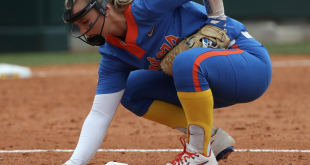 Florida returns to Omaha this year as the No. 1 national seed and the defending national champions. 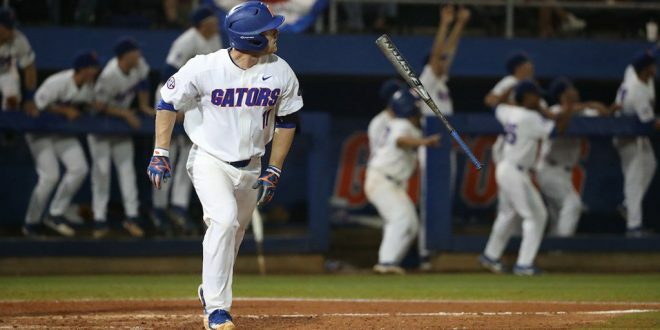 They punched their ticket after an 11th inning, walk-off home run from Austin Langworthy gave the Gators the Game 3 win over a gritty Auburn team. 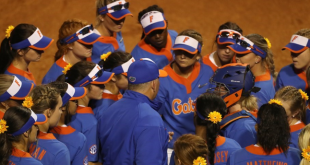 The Gators will go into Omaha as one of the favorites again. 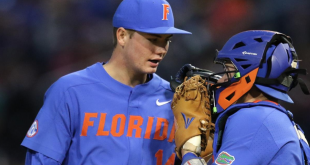 Led by a pitching staff of first-rounders Brady Singer and Jackson Kowar, along with All-American closer Michael Byrne, Florida’s pitching-first mentality lends itself to a pitchers park in TD Ameritrade Park. Head coach Kevin O’Sullivan said Monday night he’s hopeful to have catcher and captain J.J. Schwarz back for their first game Sunday night against Texas Tech. Florida will be joined by fellow SEC teams Arkansas and Mississippi State. The Razorbacks are the No.5 national seed and are coming off a 14-4 victory in Game 3 of the Fayetteville Super Regional against South Carolina. Arkansas will be making its ninth College World Series off the back of a stellar season both at the plate and on the mound. They launched 94 homers this season, the most in program history. On the mound, they had a 3.53 ERA through Jun. 1, best in the SEC. That effort was led by junior ace Blaine Knight. The third-round draft pick of Orioles this year went 12-0 with a 2.84 ERA and 92 strikeouts. Mississippi State meanwhile also required extra innings to punch its ticket to Omaha. 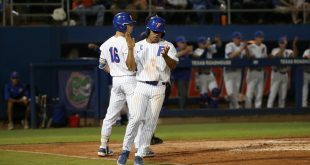 After blowing a 6-3 lead in the bottom of the 9th against Vanderbilt in Nashville, the Bulldogs rebounded in extras, scoring four runs in the top of the 11th inning and sealing their passage with a 10-6 victory. Jake Mangum is the main guy at the plate for them after batting .353 this season. Elijah MacNamee has emerged in this postseason, with the .318 batter hitting two walkoff home runs this postseason. Meanwhile they have a third-round pick in Konnor Pilkington in their pitching rotation. The other five teams in Omaha represent the Pac-12, Big-12 and ACC. From out west, Oregon State and Washington will make the trip to Nebraska. Oregon State is a perennial powerhouse, and will making it’s seventh College World Series appearance. They’re two-time champions, but will looking to avenge their showing from last season, when they were the top overall seed but were eliminated by LSU one game away from the finals. Washington on the other hand is the feel-good story of this group, making its first ever trip to Omaha. The Huskies booked their spot after a thrilling Super Regional against Cal-State Fullerton. Washington fell behind in the top of 9th and top of the 10th, but rallied both times before coming through with a bases loaded sacrifice fly. Two schools from Texas are in the field via Texas Tech and Texas. 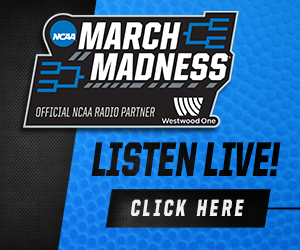 Texas Tech comes in having defeated Duke in three games in the Lubbock Regional. The Red Raiders first game is against the Gators on Sunday. Texas meanwhile is the definition of a mainstay. The Longhorns defeated Tennessee Tech in their Super Regional and will make their 36th College World Series appearance. No other school has more than 25. Finally, North Carolina will be the ACC’s one hope in Omaha. The Tar Heels defeated Stetson in the Chapel Hill Super Regional in two games. They’ll be looking to make noise in the last eight on the backs of their pitching staff, with sixth in the country in strikeouts per nine innings and top 40 in ERA. The action from Omaha kicks off Saturday with coverage on ESPN.